DeAnza Cove, Mission Bay, San Diego CA, USA. Sunday, January 25 2015: Friends of Pacific Beach Schools (FOPBS) School Yard Dash. The 2nd annual charity event which raises money for the six local schools in the Mission Bay Cluster, comprised of a 1-mile run for kids followed by a 5K run for all ages. 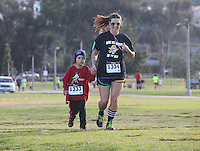 Besides parents, teachers, staff, students and siblings competitors from all over San Diego and abroad ran in the event. All six schools in the Mission Bay cluster had information booths at the event for potential parents to meet and speak with staff and students. Music was provided by local teenage band Rubber Band and the string ensemble from Crown Point Elementary School. © Ronan Gray Photography |CONTACT |All Images Copyright Ronan Gray (858 414 0383). All rights Reserved.